Product #21309 | SKU 509945 | 0.0 (no ratings yet) Thanks for your rating! 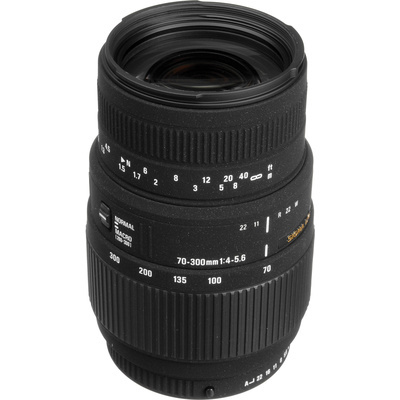 The Sigma 70-300mm 4-5.6 DG Macro lens is the compact and economical choice for a telephoto zoom lens. Capable of macro photography, this lens has a 1:2 maximum close-up magnification at the 300mm focal length. It is the ideal high performance lens for portraits, sports photography, nature photography, and other types of photography that frequently use the telephoto range.